Screened porches are an easy and affordable way to enjoy being outside during the warmer months without having to worry about bugs and mosquitoes. Midwest Builders can build you a custom sized screened porch that can enclose all or part of your outdoor living space. 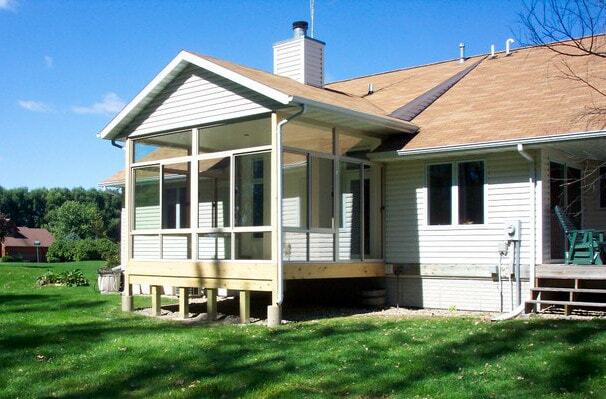 We can quickly install screens onto your existing porch, or construct you a screened in porch from scratch. Give us a call today to receive a free quote, and we can help you get started on your next project. Our company is based out of Ankeny, Iowa, and serves a 75-mile radius around Des Moines. We are one of Iowa's largest building contractors and have had a great reputation for building quality structures since 1954. Midwest Builders has a trained and experienced team of contractors that are extremely efficient, easy to communicate with, and are mindful to the needs of their clients. Check out our testimonials to read more about what Iowans have to say about us and our work. Come visit our full-size showroom in Ankeny, IA to see for yourself the kind of work that we can do. We feature a fully finished garage, as well as a room addition and patio room. We are one of the only contracting companies in the area to offer this kind of opportunity. If you are wanting to build a screened porch in Des Moines, IA and surrounding areas, call Midwest Builders today. We are your building experts for porches with screens, 3 season rooms, 4 season rooms, and aluminum patio rooms. Call us today to get started with your free quote.